Want a well trained dog but don't have the time? We will train your dog for you! From basic obedience (sit, down, heel, come, stay, leave it) to problem solving and confidence building, we offer training for all breeds over 6 months. We do all the hard work using positive reinforcement training, and when you pick up your dog we teach you everything as well! You'll be amazed at how fun dog training is once your dog has all the basics learned! Give us a call to see what we can do for you! Due to high demand, we have opened one last slot for April 2019, May has 4 spots left! Contact ASAP, they do fill fast! Call and leave a message. The total cost for our 2 Week Board and Train program is $885 and includes a custom training collar that is fitted to your dog and sent home with you, a workshop at the end of their stay and a total grooming before they leave. We do not use electric/shock collars in our program. Cash only, no checks please. Purina Busy Bones (preferably twisted)- At least 2 packs of 6, small/medium size MAKE SURE THEY AREN'T MINI SIZE. Soft Treats (We prefer 2 large bags of Bil-Jac Original Recipe training treats, or 4 bags of America's Vet dogs which help veterans get service dogs, or 2 bags of grain free recipe if neither of these is available) If you cannot find these, please do not get Blue Buffalo treats or Zukes, the dogs tend to not like them as well. Pet Botanics and Crazy Dog Train-Me treats are other brands they seem to enjoy. Feel free to contact if you are having trouble finding training treats. If you would like your dog to learn the command "Place" please also purchase a cot bed for them to use, click the blue link for our recommendation. Size large will fit most large/extra large dogs. We post occasional photo and video updates of each dog currently in this program on our page "Stonehill Training Updates" Feel free to click the blue words and like the page if your dog is staying with us for training. Below are just a few of our happy training testimonials! Jill Johnson and "Kona" a doberman pinscher. "Hi Shelly, I just want to take a moment an thank you for the training and time you put into Kona. It's only been 2 days but I am so pleased with her training, she has been doing awesome and so willing and ready to train it's great! We have been working all exercises and no problems. Thank you and your family!" Mary Toll "Noelle," Aussie mix and "Bella," Lab mix. Mary was having problems with her Australian shepherd mix, Noelle. She couldn't be near other dogs with lunging at them. Worse, she and Mary's other dog Bella would get into spats with each other. After each dog stayed for two week training, Mary says "They are completely different dogs! I'm so grateful to Shelly for restoring peace in my home and helping me to gain control." "Thank you Shelly and Stonehill Kennels! Solomon is doing great! He has so much fun going through his training routine at home and so do we! You really did an awesome job, now we just have to let him keep training us! Lol"
"I just got my Charlie back from a 2 week training at Stonehill. I couldn't be happier! I walked him in the Clio parade and took him to the carnival. He was a rockstar! Amazing around people, especially children. Considering having him trained to be a Therapy Dog. Thank you Stonehill!!" "My Stonehill puppy is 6 months old and went through the two week training with Shelly. I can't begin to tell you how amazing she is now! Thank you Shelly, for all you do for your dogs, even when you're going through difficult times. You put your whole heart into our puppies and it shows! Anyone questioning is the training worth it. I am assuring you it will be the best money spent, after of course, getting a puppy! Thank you again from the bottom of my heart!" While it was very, very hard to leave our 5-month-old Emma for two weeks, we knew she would come back a much better-behaved dog - and she did. We had trouble getting solid results at home in training “Leave It,” and “Heel,” but when we came back to work with Shelly for the two hour “Puppy and Parent Review,” our lovely Emma executed flawless heels both on and off leash - with NO pulling while on leash. Additionally, Emma was taught an extended down-stay that still lasts many, many minutes if we want it to. Shelly’s ability to get Emma to respect and follow without fail the “leave it” command was probably life-saving on more than a few occasions in Emma’s young life and will no doubt protect her in the future. dispensing treats or verbal positive reinforcements. She’s pretty darn good with positive reinforcements and verbally instructing we people owned by dogs (in the context of dog training), too! We’re both trained as teachers and have worked with students of all ages. Ananda Emerald Rose von Stonehill (Emma) is our fourth dog and third GSD. We know how hard and rewarding both teaching and dog training can be. While our appreciation for the entire Stonehill staff and operation is great, our respect for Shelly’s ability to train dogs and teach the people who love them knows no bounds. Without Stonehill Kennels and Shelly Powell’s astounding breeding and training abilities, we wouldn’t be enjoying the experience of living with Emma, our terrific, incredible, once-in-a-lifetime dog. "We took our rescued Alaskan Malamute to Stonehill for the two week board and train program. Shelly did an amazing job. I couldn't believe the difference. He went from uncontrollable to a really well behaved boy. I recommend Stonehill over and over again." 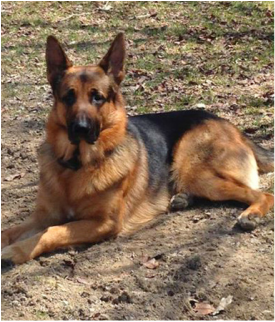 "About a year ago my husband and I were given a four month old male German Shepherd He is a high energy, strong dog that demands your continuous attention, primarily to play fetch. He would set his toy on one of our laps and nudge you with his snout with such force that we resorted to sitting on our hands to deny him access. My husband and I have both been around dogs all of our lives and consider ourselves accomplished dog owners. For the past year we have been trying to train Kojak with little success. We taught him to sit and he would if you had his fetch toy in your hand, but, if we are out back with him and there's a squirrel in the yard he refused to acknowledge that we were there. He was developing bad habits and we realized that this breed is different and "we" as in all three of us needed training. We turned to Shelly at Stonehill Kennels for help and in two weeks she was able to bring Kojak under control and patiently teach us how to curb his demanding behavior. Shelly taught us to be firm with our directives, enthusiastic with our praise and generous with his treats. Kojak's turnaround is remarkable. He still is a happy dog with lots of energy. He still loves to play fetch, but now, when we say enough, he no longer "mouths" our hands to continue. We can now take Kojak for walks and not have him tugging our arms off. We are very satisfied with the care, and training that Shelly gave our dog and to be honest we are shocked at the difference in Kojak, he listens and is very eager to learn it just took a good trainer to teach him and us. "My wife and I couldn't be happier with the results in our Mini Australian Shepherd (Bailey). Shelly and Stonehill kennels were awesome in his training. Couldn't be happier. We will definitely be back for the puppy socials and will explore more training opportunities with Shelly (when time allows :) )"
Since this review, Bailey has been a staple at our puppy socials. He loves playing with the big dogs and being "an honorary GSD"
I meant to drop you a line closer to Christmas but things got a little busy around here. I just wanted to let you know Jovie is doing well and we’re all very appreciative of all the work you put into training her. She far exceeded our expectations on how she handled the stress of new people in our home, and I am so proud of how she’ll stay calm and gentle around the baby. (Mostly she sniffs her cheek and then we tell her to lay down and stay nearby. Olivia thinks it’s absolutely fantastic!) The older two girls have also taken well to using the same commands and treats as you showed my mom and me. "I am beyond pleased with the work Stacy did for Trakr. He is a totally different dog obedience wise and still has his same personality. I will be using Stonehill from now on and referring everyone I know!"